A shaman. Spirit animals. Ancient warriors. 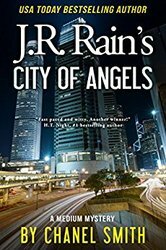 In CITY OF ANGELS, Julie, a psychic and Pauline’s estranged best friend, shows up with Blue, a familiar shaman who unleashed a force that has the power to maim and destroy. Strange things are afoot at the Cal State, Long Beach campus, which is also the site of an ancient Native American village and burial grounds. One college student is already dead—and the threat is spreading. Because Blue has been toying with powers beyond his understanding, Pauline and Mack must deal with the malevolent force. They all head to the campus where a Native spirit accuses Blue of a serious crime against the tribe—a crime that calls for grave punishment. Can Pauline and Mack resolve the bad blood between Blue and the ancient spirit without getting them all killed?